At the bottom of the Garden: Packages in the mail for the big boys! Packages in the mail for the big boys! Just as the real estate agent turned up for her fly through visit (gawd, you spend days cleaning a house and she is in and out in 2 minutes, no joke, but as always impressed with how clean we manage to keep the house, especially with three boys! If only she knew, hahahaha! ), the mail man also turned up with some packages which turned out to be all for the bigger boys. Oh the excitement! The first package was totally unexpected, even by me (I usually know when something is on it's way). It was from the Sun-Earth project. 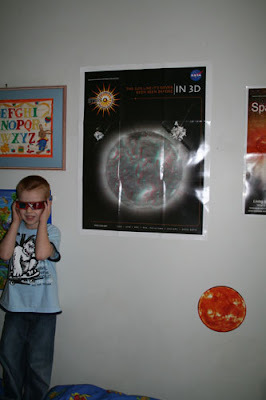 A NASA run project to teach schools, and homeschoolers about space. You send in for a package which is sent out at the beginning of the year, which contains a theme for that year (last year it was eclipses, this years it's weather in space). I signed up for this last year because the boys were really into all things SPACE at the time, but I didn't realise I would stay on the mailing list this year as well, so this was an awesome bonus! Here are some of the other posters, the endangered animals and flags of the world posters were not in the set, they came from The Learning Ladder... 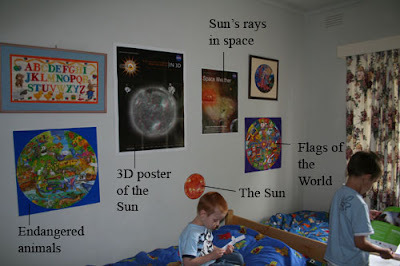 Besides the 3D poster there was a mini circular poster of the sun, a poster showing the Sun's rays in space, and post (not seen here) of the Satelite Voyager (which is hanging on the back of their bedroom door), so lots of goodies!!! The second package for the boys was one I knew was coming, and was a surprise for them from me. 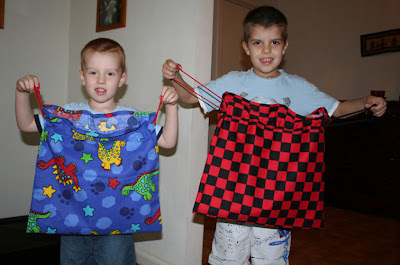 They needed library bags for school, and so I ordered these two bags ($10 each, and no cost for postage!) from The Complete Fabrication . Luey's has dinosaurs on it, just like his name tags on his property stickers, and Erik have red and black checks the same colours as his fave pair of pirate socks! I'm really impressed with the quality of these bags! The fabric is nice and thick, and sewing is great too, for $10 these are a bargain!